It doesn’t matter what type of gambling you like to do, you can find it online. Blackjack, slots, poker, sportsbetting, you name it. You can even bet on scratch cards. Yes, scratch cards. Those tiny cards you can buy from your gas station or out of a machine at your local grocery store. However, from my experience these are much more fun – more much addicting – online compared to the cards you buy live. The idea behind this article is to give you an overview of online scratch cards. I’ll explain how they work, what types of themes there are and whether or not I think they’re worth playing. First off, I’ll point you in the direction of where to play them. Where to Play Online Scratch Cards? There are a number of casinos that offer scratch tickets. Some more than others, though, so you might want to look at each casino to make sure they have the variety and quantity of games you want. Online scratch cards have several names. This includes instant wins, scratch offs and scratch games. Keep that in mind if you search online for advice, themes and casinos. The idea behind these are simple. You’ll choose a card you want to play, the amount you want to play for and then hit play. A new scratch card (“game”) will load. You then have two options. One, you can take your mouse, hover over the images/squares that need to be scratched off, click your mouse and move back/forth, then unclick your mouse and the image underneath will appear. The second option is to click the ‘scratch all’ button and the entire scratch card will appear. You’ll then know whether you won or lost, and then you can start a new card. Get images in a row or diagonally to win. Play bonus games. You’ll be asked to choose one icon out of x to receive a payout. Get 3 of one image in a row/diagonal and you’ll be paid a multiplier of your wager. It’ll vary from card to card. The best way to describe it is to think of these like a combination of scratch cards and slot machines, with objectives and bonus rounds. One of the main reasons that online scratch cards have become popular is because they are so cheap to play when compared with other poker or traditional casino games. The cost of play tends to vary from card to card and is clearly displayed when you select a particular game. However, generally speaking players decide how much they want to pay, with the cost starting from as little as $0.05. However, you should remember that the prize money on offer depends on the original cost of the card. Therefore, a player who hits the jackpot while paying $0.10 for the card will receive a prize of $10,000 where as a player who has paid $1 for the card will be given $100,000. Either way though, you’re guaranteed a VERY nice return on the original price. Again, scratch cards are a lot like slots. One of the best things about them is that they have themes. This is what makes the games fun and keeps you interested. For example, if you’re a guy, like me, you don’t have to play those girlie celebrity, girls’ night out or crazy cat themes. Instead, we want to play themes like Captain America, Iron Man or the 6 Million Dollar Man. Holidays – Easter, Thanksgiving, Christmas, etc. There are tens, probably hundreds of themes that don’t fit a specific category, too. Just fun ideas like Rubik Riches, Lucky Charms and Meet Max. I go could on and on. You’ll just need to sign-up to a casino, search and find the one that appeals most to you. Are Scratch Cards Worth Playing? Honestly? Hell no. There’s no way to beat scratch cards. 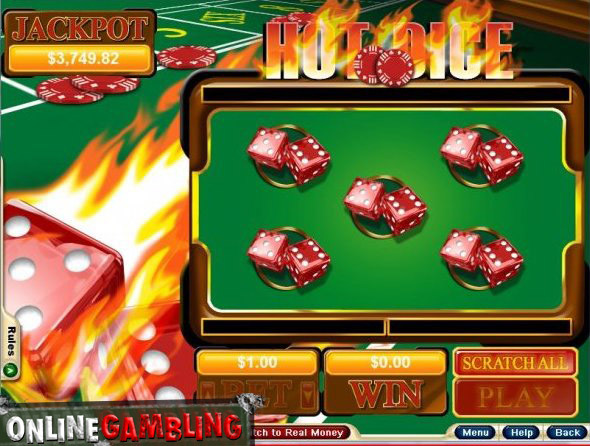 It’s pure random luck, very much like slots, keno, roulette and any other casino game that can’t be beaten with strategy. But, like lottery tickets, you don’t by ’em because you expect to win every time; you buy them for the chance of a big win for a small outlay. On the internet, you can buy scratch cards for $.20. And while that will add up quickly, it’s still cheaper than the scratch cards you’ll buy in the convenient store. It’s also one of, if not the cheapest game you can play in an online casino. So if you’re going to play online then I don’t see much harm in playing scratch tickets. Just know that you can’t beat them and that the only way to win money is to get lucky. Do note that you can also play scratch cards for free. Most casinos will let you play for free as long as you’d like. And at some casinos you don’t even need to create an account — just click their “practice” link and the game will load in your browser.